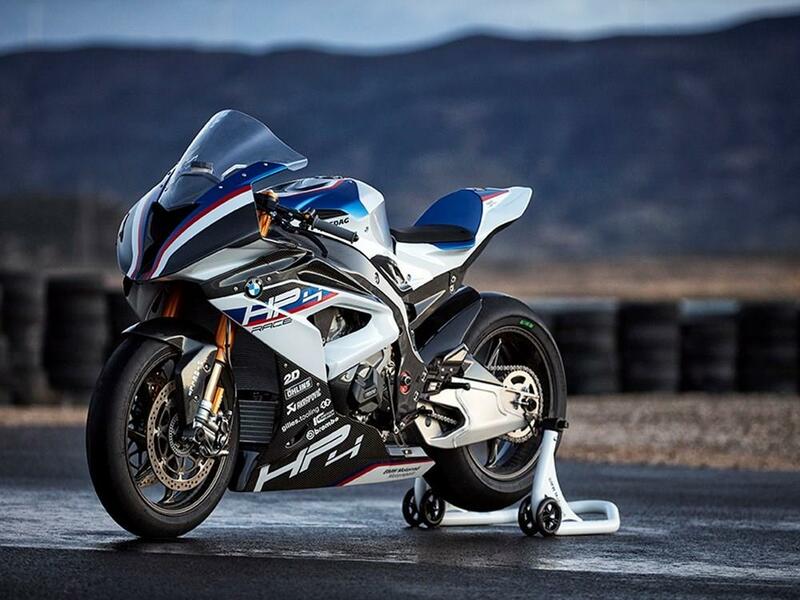 We're riding BMW’s new £68,000 HP4 Race at the Estoril circuit in Portugal tomorrow. The carbon-framed, track-only superbike makes 215bhp and weighs just 171.5k full of fuel (and a staggering 146kg dry). That’s an even more impressive power-to-weight ratio than Ducati’s £72,000 1299 Superleggera. It also comes with higher-spec suspension and brakes than the beautiful Bologna bullet. Only 750 will be made and bikes are expected to arrive in dealers in September. We’ll be on our social media channels during the course of the test to give you our first impressions and the full test will be in MCN next Wednesday. Based on BMW’s inline four-cylinder S1000RR motor, the World Endurance/WSB-inspired HP4 RACE engine has weight-matched pistons, Pankl conrods and crank bearing shells. It’s fitted with hairier inlet and exhaust cams, longer and wider intake trumpets, a 200gram lighter crank and a milled ali sump. Compression ratio is up from 13.7 to 13.9:1, with maximum power up from 199bhp@13,500rpm to 215bhp@13,900rpm. The motor is pre-run-in from the factory, so you can take your HP4 RACE straight from the dealership to the track. A new racing gearbox has a longer first and second and shorter higher ratios. Only third gear is the same as the S1000RR. An upside down ‘race shift’ gear pattern comes as standard, as well as a quickshifter and auto-blipper. A full 4-2-1 titanium Akrapovic race exhaust is topped off with a carbon can. Industrially manufactured in a single piece, the high-strength 7.8kg carbon fibre frame is created with varying levels of stiffness and flex for stable handling and cornering feel. And of course it’s light, weighing 4kg less than the RR’s three-piece cast ali frame. Unlike the new 1299 Superleggera's carbon item, the BMW’s deeply underbraced, girder-stiff swingarm is fabricated from good old-fashioned aluminium, pinched from their WSB bike. Nickel-plated Brembo GP4 PR calipers are race grade and feature coated titanium pistons. One-piece self-supporting seat unit can be easily unbolted and fixed in three positions to suit rider preference, giving a seat height of 816mm, 831mm (from the showroom) and 846mm. BMW HP footrests are eight-way adjustable. Sharing its in-house manufacturing technique with the frame, the carbon fibre wheels weigh 30% less than BMW’s forged ali racing items, have 40% less gyroscopic force and are stonger. Fully adjustable Ohlins FGR300 forks and a TTX36 GP shock are the staple of a MotoGP and WSB paddock. Milled ali top yoke design is taken from the BMW WSB racer. Steering offset, head angle, swingarm pivot and rear ride height are all fully adjustable. The HP4 RACE also comes with a choice of three front and five rear sprockets. Electronic rider aids are tailored towards the track and an evolution of the current RR’s. Rider modes are now called Wet, Intermediate, Dry1, Dry2 and you also get launch control and a pitlane limiter. The traction control now uses an ignition cut so the rider can hear it pop as well as feel it when it chimes in. 15-stage traction and engine braking control and a five-stage anti-wheelie can be adjusted gear by gear. A full digital racing 2D dash contains a bewildering amount of information and also logs lap by lap data, which you can download back in the pits. Road switchgear makes way for racing clusters with easy to use traffic light buttons. Your £68k also buys you a clear-lacquered, brushed ali fuel tank, carbon fibre panels, a lithium-ion battery and a numbered (1-750) top yoke. Frame One-piece carbon fibre twin spar with fabricated ali swingarm. Seat height Three-way adjustable: 816mm, 831mm (from the showroom), 846mm. Suspension Fully adjustable 43mm Ohlins FGR300 forks and single Ohlins TTX36 GP shock. Front brake 2 x 320mm discs. Brembo GP4-PR four-piston radial caliper. Colours BMW HP Motorsport colours.